To me, nothing says Summer more than sleeping in, slowing down and sitting on a blanket beneath a canopy of old oak trees. Just as the quote says, I actually have been "looking up into the branches of the towering oak trees" and being a bit more reflective as of late. Most of the time it's when I walk our dog in the morning when the world is just stretching its arms out and opening its eyes. Needless to say, when I came across this quote the other day, it seemed so perfect for where I'm at right now in life. I take more time to look into my kids' eyes when they are sharing something with me, or I with them. And mostly...I've cut many of the ropes of self-expectations that have bound me tightly for most of my life. It feels oh so good and it's pretty amazing the difference these changes have made. I love the line in the quote that says "send my roots deep into the soil of life's enduring values." I've always said I want to "live a life that has an organic authenticity with an heirloom quality to it." When I find myself getting lost...or feeling distant from the values that live deep in my heart, it seems the majestic oak trees always have a way of calling me back to the place I am meant to be. So yes, I immediately felt a connection with this quote from an unknown author as soon as I read it. I loved it enough to take time to create a simple art print using it. 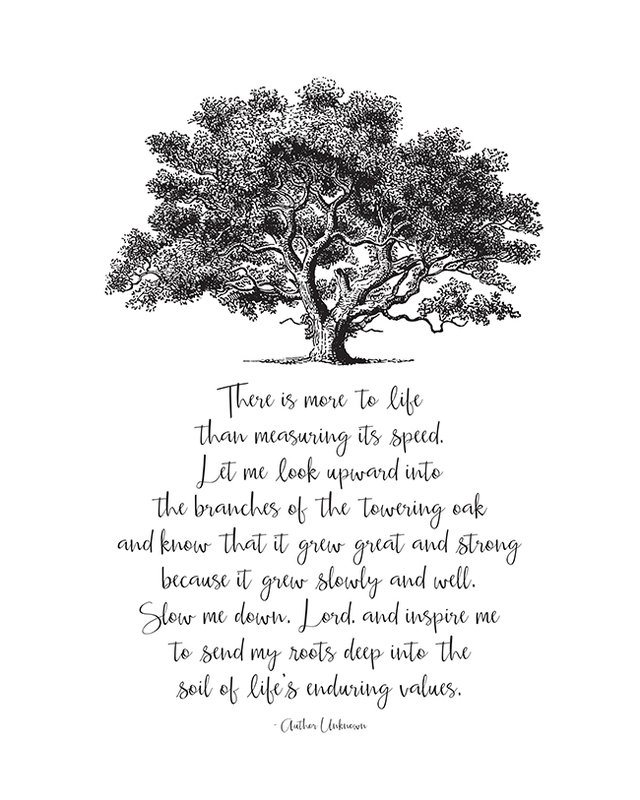 If you share my love for oak trees too or just love the message in this art print I designed, grab the FREE 8x10 DOWNLOAD HERE! I hope you all have been having a wonderful Summer! And most importantly...I hope you've been finding ways to slow down. P.S. Super excited about our Family Reunion coming up this weekend! My family tries to have them every 18 months and I've been missing them.